The Bavarians have priced their flagship sedan handsomely. As the flagship sedan in BMW's lineup, the was never going to be cheap. But just how much will the new one set you back, with that gaping maw? 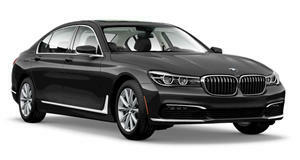 At least $87,445, according to the new US-market price sheet released by the Bavarian automaker. The base 740i carries a sticker of $86,450, the requisite $995 destination charge. That's already nearly $3k more than the outgoing version, and that's just the starting point for the "entry-level” version with the 3.0-liter turbocharged straight-six and rear-wheel drive. Opt fo all-wheel traction in the 740i xDrive and you'll be looking at $90,445 (delivered), with the same 335 horsepower and 330 lb-ft of torque channeled to each corner. Go for the 745e xDrive iPerformance plug-in hybrid and you'll get 389 hp and 442 lb-ft, but it'll cost you at least $96,545 (before options). Next up the list is the 750i, which packs a 4.4-liter twin-turbo V8 good for 523 hp and 553 lb-ft. It comes with xDrive traction as standard, but will set you back $103,645. And at the top of the heap is the M760i xDrive performance model. With the 6.6-liter twin-turbo V12 rated at 600 hp and 627 lb-ft of torque, the M760i goes for $158,695 – including delivery, but before the $1,700 gas-guzzler tax. BMW has priced the revised 7 Series competitively against its key rivals. At $84,795 (delivered), Audi charges slightly less for the , which offers the same power but more torque in 55 TFSI spec (currently the only one available). And at $92,245, Mercedes gets a bit more for the (which packs a stronger punch). Priced from $150,545, the costs slightly less than the M760i (with similar output), but the twelve-cylinder costs much more at $230,495.